Um, I did say five faces in seven days, didn't I? I guess not, but I've had a hard time keeping up with this challenge! Just a busy week! So this is my last face - sort of a wood nymph, mother earth type lady. I'd like to explore this idea a bit more. She is a cut paper person, and the photo was taken under the worst circumstances, at night in artificial light. From this challenge I have learned that I do love to do faces, I have trouble keeping up with "one a day" and that it feels good to be creative!! My next post will be my 100th - can't believe it!!! I'll be announcing a giveaway and I hope I'll get a good response! 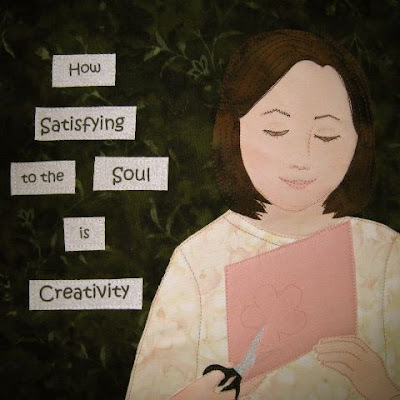 By the way, if you would like to see some lovely faces, visit Terri Stegmiller's blog and enjoy her great artwork! Just finished up this Lady, whom I'll call the Catalog Queen. I used images from magazines and catalogs and had a good time with it. Tomorrow I'll post my final piece for this challenge! This impish face is inspired by a little boy I tutor. Sometimes his mom gels his hair up straight and I love to touch the top lightly - it feels like a hairbrush!!! This is a fused fabric applique. I hope to get another face done and posted today since I'm now way behind!! But it doesn't really matter - I'm learning what my limitations are, plus I'm enjoying making these people and their faces. So much fun!! This week has been busier than I expected and I'm a bit behind, but here is my picture for day 2. Another face in cut paper. What is this lady thinking about? I have a few ideas, but you can come to your own conclusions! I thought I'd try for a different type of expression, but those crazy eyebrows say it all! Here is the result of my first picture in this challenge. This little girl is made from cut scrap book paper, with some permanent marker and pastel chalk for shading. I'm discovering that I've set a tough challenge for myself. I love to do people, but they are not easy!! I wasn't 100% happy with how this came out, but I have to leave her now and go on to another "personality"! These fused bouquets are very small and work up quickly. I used a scrap of decorator fabric for the vase and cut the flowers and leaves from some scarf - like fabric I had stashed away. I used to buy odd pieces of fabric from a great little shop which no longer exists. There were bins of real scraps, which really intrigued me - great for applique pictures! I've decided to jump into another challenge this week - five projects in five days! Thoughts on "Seven in Seven"
After finishing and posting my seventh project yesterday, I wanted to review the process and come to some conclusions about it. I jumped into this challenge very impulsively and really set no parameters for myself other than making seven art projects in seven days. For someone who is used to doing things "when I feel like it" or "when I feel inspired", this was a stretch for me. I found myself thinking about my projects constantly during the week, whether planning, looking for materials, doing sketches or actually working on each piece. Although I had many other things going on in my "real life", I felt a joyful buzz just knowing that I would be going back to whatever project I was working on that day. The fact that a few projects got finished later at night didn't bother me, nor the fact that some pieces could use a few more details. I simply took photos the next morning or brought the project to a point that could be considered finished, but left it to my own discretion whether I will work on it further or not. My feeling is - enjoy the process, try some new things, have fun! My next self imposed challenge will probably run five days. I'm thinking of doing a series of works on the same subject, expressed different ways. I'm still thinking about it. If anyone reading this is interested in playing along, let me know. I'd love to see what someone else does with this idea! Here is a little window bird which I completed this morning. The day is so rainy it's just about impossible to get a good photo. I had made a prototype of this bird a few years ago, and it sits in front of my kitchen window. Just seeing the silhouette against the window view makes me happy. I'd like to make this bird in many different ways, with different materials and colors, and that opens a window to another possible challenge for me. So this ends my "Seven Projects in Seven Days" challenge. Later I will write my observations about it, but right now I am happy to be finished!! Once again, I finished this too late to take a decent photo. Another fused fabric picture - no stitching for now, but I may go back and add some. I'm thinking of doing a series of tablescapes with these black accented prints. I love working with a palette like this and look forward to doing more. A very simple project today ~ a little ATC inspired by all the flowers I encounter throughout my day. Although they are part of the season, and something I have seen all my life, I'm still so inspired by the artfulness and beauty of each individual bloom. Today I worked on this paper portrait which I'll call "Coffee Pleasure". The lady was done with a scrapbook paper background and I used various art papers and cardstock for her face, hair and hands. For about the last 25 years I've concentrated mainly on fabric art as my means of artistic expression, but lately I've found cut paper to be very easy and enjoyable also. So many modes of expression, so little time!!! Time to relax for a while and plan something for tomorrow!! Here is a fused fabric applique picture which I worked on yesterday and this morning. I had painted the sky fabric this past Monday morning, using Setacolor paints on prewashed cotton fabric. The tree silhouettes were sketched on the wonder-undered black print fabric and cut out. This is about as far as I can take it right now, but I'd like to stitch it in a sketchy manner with black thread at a later time. I'm working on a cut paper project for this, my fourth day. I hope to get to post it later! In case anyone is following my weeklong series of projects, I'm here to report that Day Three project is in process! It will be finished later tonight - too late to take a photo in natural light! So, I'll be posting the results in the morning - stay tuned! My friend Janice sent me this lovely ATC recently. Janice uses a layered process of coloring and stamping and the entire card is waxed, giving it a richness and depth. My photo doesn't do it justice. Today I finished this ATC, which I'll be sending to Janice. We've been trading cards every month and this one is actually for May. I'm a bit behind! It was hand embroidered and beaded, with lace trim and a little bird sequin. Although I had a very busy day today, I was glad to be able to finish this little piece of work! I'm beginning to see that this is quite a challenge I've set for myself!! Hmmm...what will I make tomorrow? Today I was excited to begin my weeklong series of projects. I knew what I wanted to create, but it took a while to work out the design. Then came the whole process of choosing fabrics. I had spent much of the morning painting fabrics, but later decided to use commercial fabrics, except for that used for the hands and face. The picture is fused fabric applique, and depicts me doing what I like to do best! Seven Projects in Seven Days! I've decided to join in on the craziness and try to produce my own "seven in seven"! Of course,my projects will be on a totally different level - far from brilliant, several will be completions of works in progress and I'm sure at least one or two will be extremely elementary! But it will be fun and, since Kate won't have a spare moment to read my blog this week, it will be something for me to share with her later! I'll be posting every day, so stay tuned and see how I do! 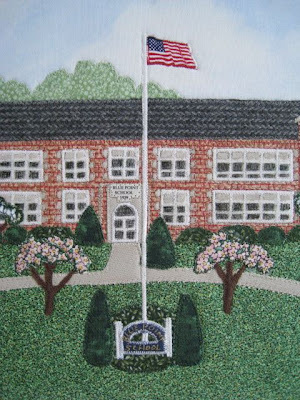 I just finished and shipped out this folk art style fabric applique picture of a school in New York. It took nearly 15 hours to complete, between cutting out all the pieces, assembling them and sewing everything down. Believe it or not, I had created this very same picture four times already, probably about ten years ago when I lived in New York! 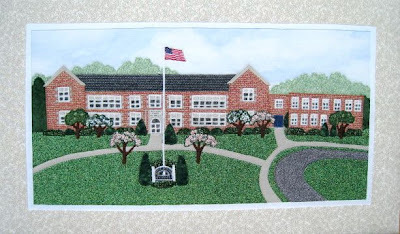 The pictures were commissioned by teachers in the school to give to retiring co-workers. I was bored to tears to think of exactly duplicating this picture yet another time, so I changed some of the fabrics and the color of the border. Still, it was tedious and I kept telling myself, "Never Again!!" Now to move on to some of my own designs. It feels good to have this piece finished!! !